Last week I purchased The Rose of Sharon Block Book by Sharon Pederson (you can find it here). What wonderful block designs! 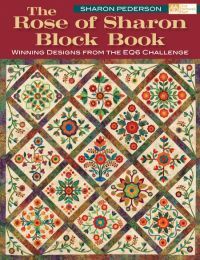 Although I had already downloaded the designs onto EQ6 a while ago, I am glad I bought the book, which features the 12 winning block designs from their EQ6 challenge, plus other 83 beautiful designs. One of the reasons I got the book was because they used batiks for the blocks. The amazing, vibrant colors from all the batiks wowed me. As I read the book (I do so, cover to cover, every time I purchased a craft or cooking book...), I was impressed first by the story of how it come about, and secondly, by the fact that it supports the Alzheimer's Art Quilt Initiative. In the introduction written by a quilter called Ami Simms, we learn of Ami's mother, who suffered and died of Alzheimer's. As I have a neighbor whose husband has had it for the past 7 years, and after having read Making Rounds with Oscar by David Dosa (see my book review here, you can get it here), I am acutely aware of the suffering it causes the patients and their families, and saddened by how people we love can so gradually and involuntarily pull away from their (and our) lives. One of the many interesting features of this book is called Quilting 101, where Sharon describes her 'quilt as you go' approach to quilting. I only made one table runner using this method, and it was great to see how you can use it even on quilts with sashing and borders. A must read! One last note: yesterday I was wondering through the Crafts section of Barnes & Noble, and noticed something 'disturbing': I have more quilt books in my library than they do!! !